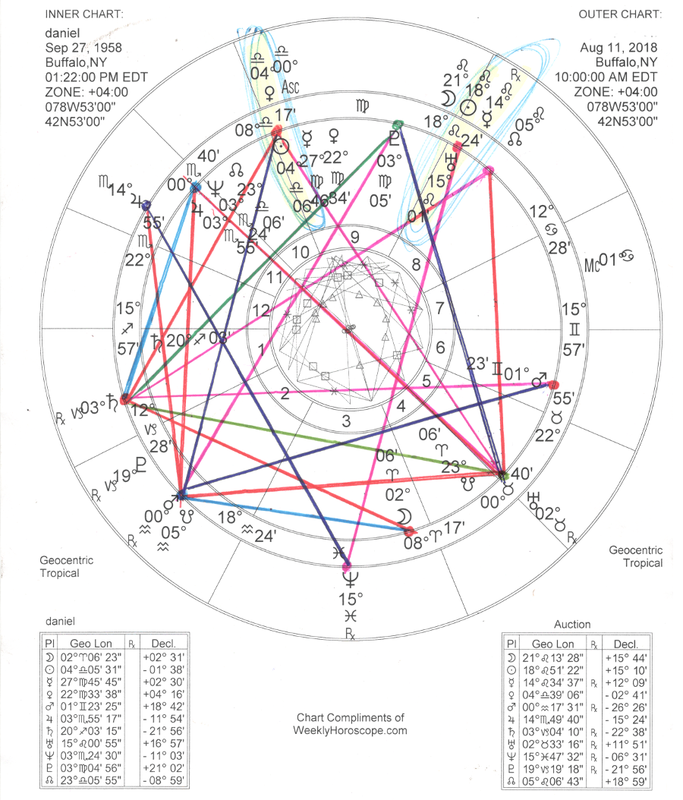 When you look at the current chart (you can see it on the Weekly Horoscope page or on Monday's Daily Horoscope) you can see what looks like this elegant chart with 2 very different planet patterns... What should be simple "yes or no" or "right or wrong" or whatever kind of answers to what you're looking for... Yes, it may appear to be that way, but in fact it can turn into a complicated mess in a hurry. I'll give you an example... Recently, I've been debating a major purchase... It's something that I really want, but at the same time it wouldn't break my heart if it didn't work out... So I decide to have a look at my "Transits" (how the current energy is affecting my birth chart)... And instantly the indecision becomes crystal clear... hehe... (see image below)... Now I am a damn good astrologer... But when you see a chart like this, it is next to impossible to "figger" what is going to happen... Trackin' with me on this?... The possibilities are endless... And that is a GREAT thing too!! What we really want to find in our charts is those "endless possibilities"... Those are the exact thing that makes the magic and miracles possible at any given moment... It's a reminder to "Keep the Faith" and to trust whatever does happen, will ultimately work to our benefit even if the initial event doesn't happen the way we might have hoped it would... So finding a chart like this is actually very comforting to me because I can just allow fate and destiny to run it's course while I do everything I can to remain "in the game". There are times when it is super easy to make "predictions" based on the movement of the planets... And there are times when that just isn't possible... (like now)... So we just need to ride the waves and allow the natural energy to guide us to where we are supposed to be. The daily horoscope for Leo is showing a lot of movement and activity in your chart... This makes travel a strong possibility in the near future as the energy is trying to expand your awareness of new options and opportunities that are available to you... Having the Node near your solar ascendant indicates very strong elements of fate and destiny are currently in play... The kind that can bring you into the awareness of a hell of a lot of people... This could transform your life too!